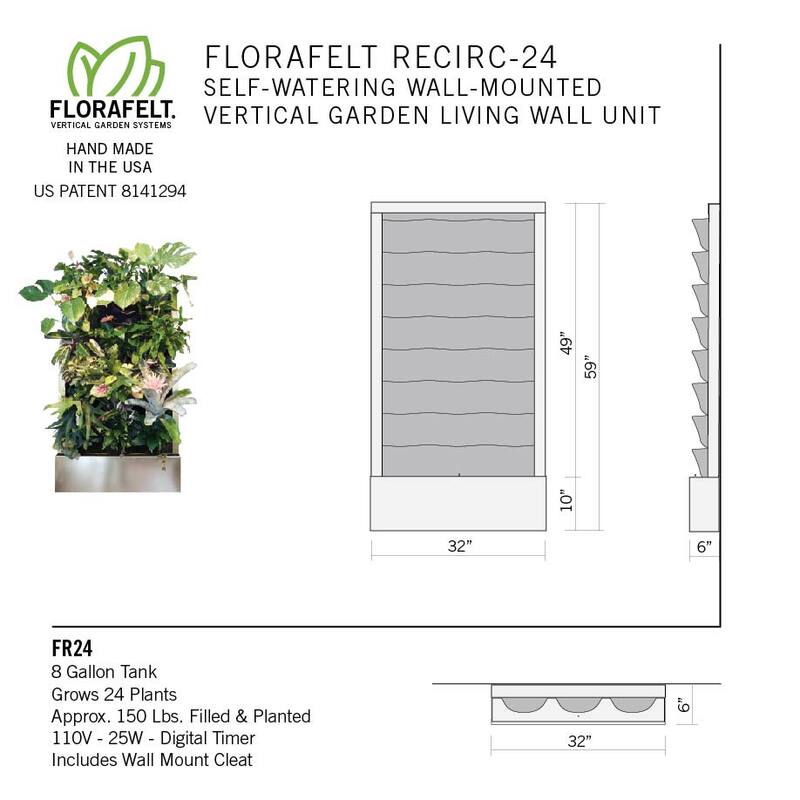 Wall-mountable vertical garden unit Includes 5 gallon tank, pump and timer 18 Gauge welded stainless steel tank and frame with brushed finish. 24 black Florafelt pockets Grows 24 plants, not included. Automatically waters itself daily. 32″W x 59″H x 6″D, 120lbs planted. Priced for factory pickup. Custom freight charges will be additional. Contact us if you have questions: (770) 406-6330. Dramatic living walls can tower anywhere in your home or patio. Each system comes with a water tank, pump and timer to keep your vertical garden perfectly fed and watered. Thin and lightweight, you can set them on the floor, mount them on walls, or put them on wheels, to move your garden wherever you like. Excess water drips into the tank where it is recycled back into the garden. A digital timer sets watering cycles and can be plugged into a standard 120v outlet. Total system includes: Water Tank, Pump, Digital Timer, and Root Wrappers. Select either 24 or 33 pocket units. Sturdy construction 15 gal. tank and frame made from welded 18 gauge stainless steel. 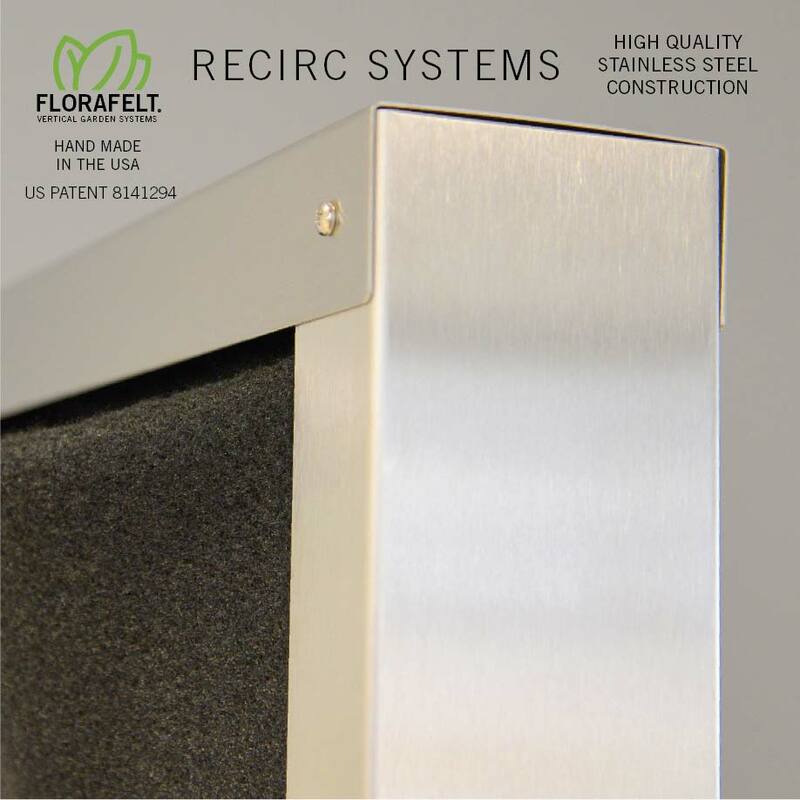 Create beautiful living walls with Florafelt Recirc Systems. Roots grow into the plastic felt just like living walls in Europe that are now over 30 years old. Each unit is self contained with it’s own tank, pump, irrigation tubing and timer. Root Wraps are included, ready for you to plant and enjoy. An abundant collection of plants converts CO2 into oxygen. Roots and soil systems that grow in felt absorb toxic VOC’s and convert them into high nitrogen nutrients for plants. Plants condition the air, absorb noise, and make our living spaces more enjoyable. 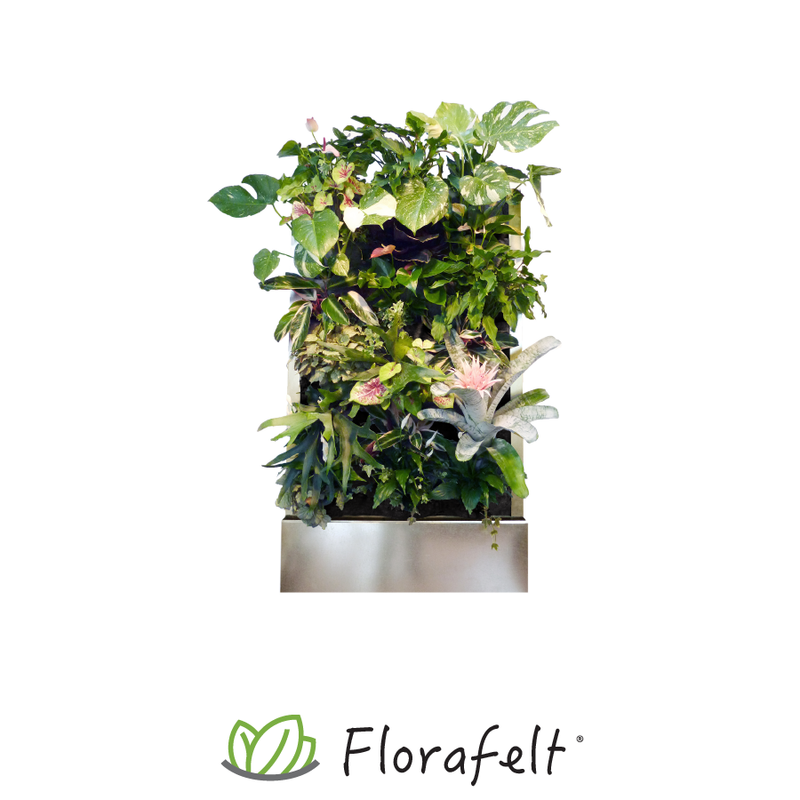 Our Florafelt pocket system with Root Wraps lets you change and arrange your vertical garden easily and mess-free. Built for life. 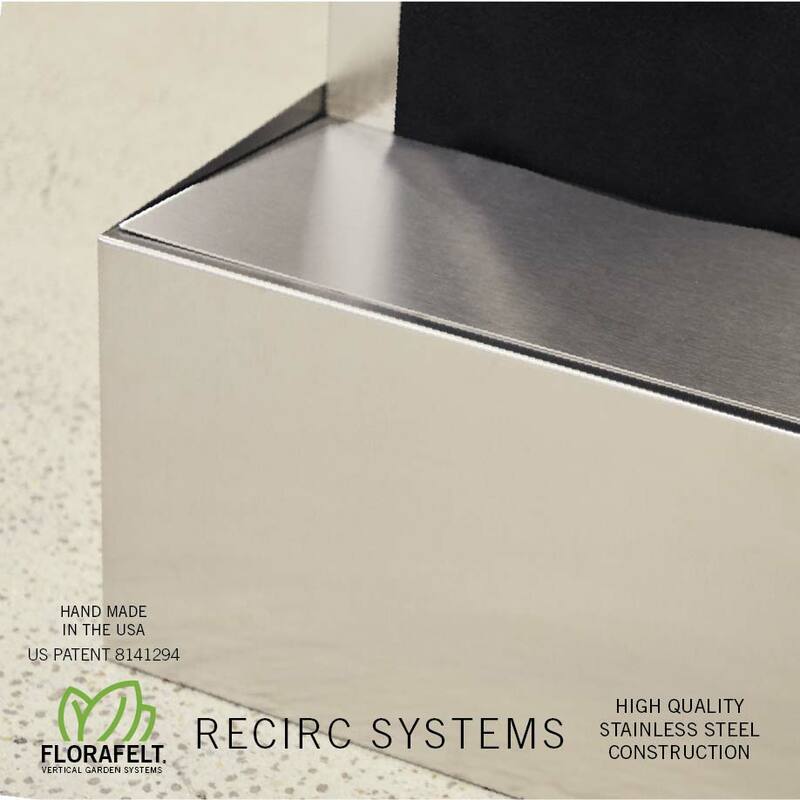 Our Recirc Systems are precision made to last forever. Grow a vertical garden that will get old growth and be there for the long haul. These heavy gauge stainless steel units will be there for you with many stories to tell.